Graceland is a mansion on a 13.8-acre estate in Memphis, Tennessee that was home to Elvis Presley. Lookout Mountain is a mountain ridge located at the northwest corner of the U.S. state of Georgia, the northeast corner of Alabama, and along the southern border of Tennessee at Chattanooga. Tennessee has more than 3,800 caves. One, in southeast Tennessee?s Lookout Mountain, contains Ruby Falls-the country’s highest underground waterfall (145 feet). Ruby Falls is 1,120 feet underground. The longest lasting live radio program is located in Tennessee. The Grand Ole Opry is broadcast on Friday and Saturday nights. 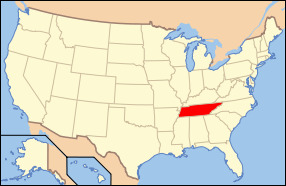 The state of Tennessee is located within the south eastern region of the United States and is the 36th ranked most extensive state in the country with a total land area of 42,142 square miles, as well as the 17th ranked most populated state with a total population of 6.40 million as of 2011. The state is bordered by Virginia, Kentucky, Georgia, North Carolina, Mississippi, and Alabama. Most of the eastern region of the state is made up of the Appalachian Mountains, while the states western border is created by the Mississippi River. The state capital is the city of Nashville while the largest city in the state is Memphis with a population of 670,902 people. The land that is now Tennessee was initially a part of the state of North Carolina and later was a part of the southwest territory, and it officially became the 16th state on June of 1796. Tennessee actually provided more soldiers for the Confederate army during the civil war than any other state, as well as more soldiers for the Union army than any of the southern states. The climate in the state is recognized as a humid subtropical climate, however some of the higher elevation regions located in the Appalachian Mountains are experiencing a mountain temperate climate or even humid continental climates because of the much cooler temperatures. Most of the climate is largely influenced by the Gulf of Mexico, and a large portion of the precipitation in the state is due to the southern winds. The major industries in the state include coal mining, enriched uranium production, electrical power, automobile manufacturing, music, farming (cattle, tobacco, cotton soybeans), tourism, and even walking horses. There are several major bodies of water within the state which include the Mississippi River, Tennessee River, Clinch River, Duck River, Cumberland River, Norris Lake, Chickamauga Lake, Cherokee Lake, Tims Ford Reservoir, and Kentucky Lake. The state motto is “Agriculture and Commerce” and the sate nickname is “The Volunteer State”. The state bird of Tennessee is the Mockingbird, the state wild animal is the Raccoon, the state sport fish is the Largemouth Bass, the state commercial fish is the Channel Catfish, the state flower is the Iris, and the state tree is the Tulip Poplar tree. Tennessee is abundant in lakes and outdoor activities also constitute a good portion of the states overall economy, making it an idea place for outdoor enthusiast to visit.